← Any Fool Can Cook. Modern Fruit Mince Tarts. Tis the season to be jolly. Fa la la la la, la la la la. I’ve lost count of all the pre Christmas catch-ups, get togethers and cocktail parties I have attended over the past few weeks. Don’t get me wrong I’ve enjoyed myself immensely. The conviviality and festive cheer. Each bite of canapé. Every drop of champagne. Perhaps a little too much. This morning I had a reality check. One great big slap in my face wake up call. For the first time in months I stepped onto the scales. The catalyst? A looming appointment to calibrate the bindings on my skis for a post Christmas holiday to Japan. Mon Dieu. The scales were not kind this morning. I need to lose a few kilos to avoid moving up into a heavier calibration category. Here is an interesting statistic that had me choking on my morning cappuccino. On average Australians gain 0.8- 1.5 kg over the Christmas period. One to two kilograms might not sound like much but researchers have identified that weight gained over the holiday period is rarely lost. What’s more the holiday season doesn’t represent one day of overeating. More like six whole weeks from late November to early January. Considering we’re only half way through the festive period I have a problem and have obviously overindulged. Time to step up the exercise regime and make smarter choices. 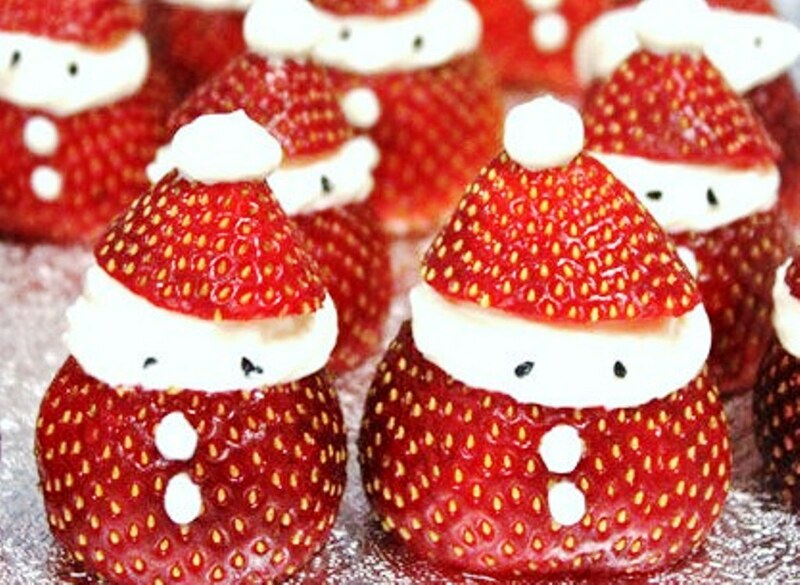 I’ve seen these adorable Strawberry Santas all over Pinterest. As a nod to a moderately healthier festive treat here’s my take on them. I love the way each Santa is a little different. How he comes in all shapes and sizes. I’m aiming to lose a couple of kilos over the next two weeks so that I more resemble the Santa to the left of the photo rather than the right. PLACE ricotta and cream cheeses, icing sugar, and lemon zest and juice into a mixing bowl and beat until creamy. Spoon mixture into a piping bag. SEPARATE the tops and bottoms of the strawberries. Dig out the inside of each strawberry bottom with a paring knife. Pipe the cream cheese mixture into the belly of the hollowed out strawberry. TO MAKE Santa’s head and face pipe a little more of the mixture to the top of the strawberry base. Pipe one or two buttons to the front. PLACE the tops of the strawberries carefully on top of Santa’s head. PIPE a pompom for Santa’s hat. Add two currant slivers for eyes. This entry was posted in Breakfast, Musings & Inspiration, Sweet Treats, To Serve with Drinks, What I Love to Cook and tagged Christmas, Cream Cheese, Food, Gluten free, Lemon, Ricotta, Strawberries. Bookmark the permalink. 6 Responses to Strawberry Santas With a Cautionary Tale. Of Christmas Excesses. Past, Present and Future. How adorable!! I love your bright photos… great blog! Thank you Julie. Its been a steep learning curve! Whatever doesn’t kill you makes you stronger. I think these are just a bit of fun.